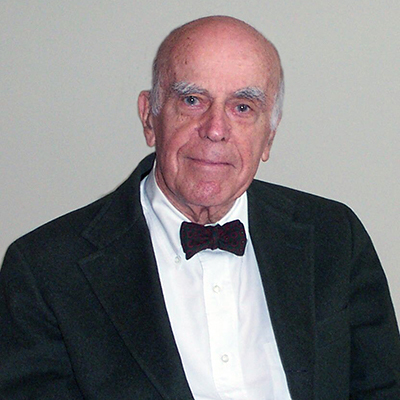 Joseph Carrère Fox, founder of the Yale Fox International Fellows Program, passed away on August 10 at the age of 101 years old, in Hamden, Connecticut. A memorial service will be held on Friday, October 20, at 3 p.m. in Battel Chapel, corner of College and Elm Streets, New Haven. All are invited to attend. Joe was a Yale undergraduate in the 1930s, a businessman, internationalist, and humanitarian. He spent much of his last 27 years engaging with hundreds of Fox Fellows around the world, as well as extending the impact and outreach of the program, which is housed at the Whitney and Betty MacMillan Center for International and Area Studies at Yale. Joe graduated from Andover and Yale, Class of 1938. During WWII, Joe served with U.S. Naval Intelligence monitoring the Panama Canal and the Straits of Gibraltar. Returning home from the war, Joe considered a career in the U.S. Foreign Service, but decided instead to go into international investment banking. He worked as an officer in the international division of Bankers Trust Company in New York City. After receiving an MBA from New York University, Joe joined Kidder, Peabody & Co., where he became a partner and remained for thirty-five years. One of his most memorable career successes was his work in post-war Japan as a member of a team that arranged the first loans to help Japanese companies revitalize and rebuild the country’s industries. The international experiences that defined Joe’s early life continued throughout his career, as his work often took him abroad, particularly to South America. He was also involved in domestic finance with an emphasis on mergers and acquisitions. Throughout his life, Joe kept abreast of international affairs both as a member of the Council on Foreign Relations and as a founding member of the Yale President’s Council on International Activities. Upon his retirement from the financial profession, Joe devoted much of his time to the Fox International Fellowship at Yale, which has the goal of enhancing mutual understanding among the peoples of the United States and other countries by enabling international scholarly exchanges and collaborations among the next generation of leaders. The program has grown from an initial student exchange between Yale and Moscow State in 1988 to its current partnerships with 20 leading universities around the world. Joe has received numerous honors and awards for his work with the Fellowship. In 2001, the University of Cambridge named him a Fellow Commoner of Sidney Sussex College. In 2003, Joe was awarded Yale’s highest honor, the Yale Medal. That same year, Freie University Berlin, Germany bestowed its prestigious Pin of Honor on Joe. Joe was predeceased by his 1st wife, Louise Lee, and is survived by his wife, Alison Barbour, and his children: Dell Fox, Lee Fox (Peter White), Henry Fox (Libby Delana); stepdaughters: Vicky Maclean and Frederica Sulzbacher (Steve), nine grandchildren, and three great-grandchildren. Joe’s passions were family and friends, languages, tennis, and Mt. Desert Island, ME. Alert until the end, he was an inspiration to many for his fortitude, curiosity, and zest for life. In lieu of flowers, donations may be made to the Fox International Fellowship through the Giving to Yale website or by mail to Fox International Fellowship, c/o George Joseph, MacMillan Center, PO Box 208206, New Haven CT 06520.